It would have a cord coming from the helmet to the bike for power would be the only problem I see from a race perspective. Other than that it has the standard D ring attachment and meets ECE 22-05 safety standard so even with that big brick on the back it seems to pass the crash tests. The Feher helmet is powered by your motorcycle battery. It comes with the necessary harness to connect to the battery and a quick disconnect cord with a switch. It is also possible to power the unit with battery packs that can be purchased separately online. On a separate note the Rule book states helmets need to meet ECE 22.05 "P" standards, that P standard only applies to the modular flip up helmets to denote the chin guard is designed to provide some protection. Do we even allow modular flip up helmets? 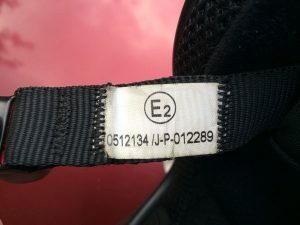 What is not explicitly stated, since the modular aspect is not specifically addressed, is that a modular helmet would have a "J-P" designation as it can be used both as a non-protective and protective setup. So by that info we would allow a modular helmet as long as it has the P standard or do they fall into the "open face" category and banned? Banned, modular helmets not allowed. I don't think I'd want the extra mass on my head if I needed to use it. Neat idea though. I wouldn't mind it if I still rode the streets. I was curious about the weight, too, Cody. Surprised to find with a bit of googling that the claimed 1450 +/-30 grams is in the middle of the weights I found for the Shoei's and Arai's I've seen many racers use; perhaps a bit lighter than the Arai Profile that was my preferred touring helmet. Not at all an 'endorsement', just a comment on the weight factor. IMHO the substantial protrusion and its potential to 'snag' something / impart a 'twist' to the neck would knock it out of contention for me. I'd only really see it viable for the endurance guys who try to eek the full 2 hours out of the little bikes in the summer heat.